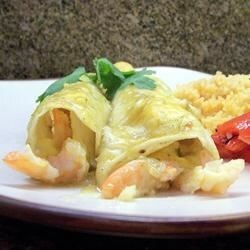 "Enchiladas made with shrimp, crab and Jack cheese. This is a great dish with a Southwestern flair." Lay tortillas on a flat surface. In the middle of each tortilla place equal amounts of cheese, crab, and shrimp. Set aside some cheese to sprinkle on top of the tortillas. Roll the tortillas to form enchiladas. Arrange side by side in a 9x13 inch baking pan. Pour green enchilada sauce over all of the enchiladas; the green sauce should cover the enchiladas completely. Sprinkle the remaining cheese over the enchiladas. Cover, and bake for 30 minutes in the preheated oven. Remove cover, and continue baking 15 minutes. Top enchiladas with sour cream and green onions to serve. Very big hit! Saute the shrimp with olive oil, garlic and onions first to give them more flavor, medium green enchilada sauce was a little mild, might use hot next time. We really enjoyed this recipe. I could not find the green enchilada sauce so had to use red but it was still delicious.